While most people wouldn't think vinyl to be a very contemporary flooring choice, there have been many innovations in vinyl over the last few years. A popular choice for kitchens, this resilient flooring is a versatile, economical option. Vinyl flooring is gaining in popularity once again. Today I would like to welcome Market Timers for a guest post on how to prepare for vinyl flooring. 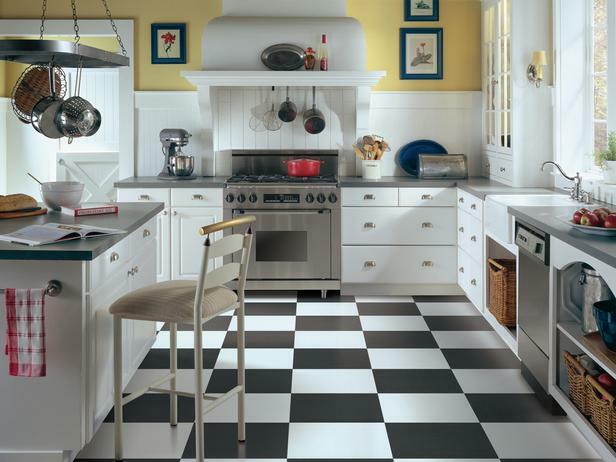 Vinyl flooring provides durable surfacing for high-traffic areas in the home. It’s also a really attractive flooring option for any house. Best of all, it’s easy to install with very little DIY knowledge. Before installing the vinyl, your subfloor should be in fairly good condition as any irregularities or bumps can cause the vinyl to tear or wear out quickly. Vinyl can be installed over old vinyl flooring so long as the surface is flat. First, check the floor for any moisture. To do this, tape a 3-foot square piece of scrap vinyl to the concrete with a piece of duct tape. Seal the edges really tight and leave the vinyl for 72 hours. Pull the tape up, and if it releases easily that means that the floor is too damp for vinyl flooring. If the floor is suitable, clean the surface with a wet-dry vacuum cleaner to get rid of any dust and debris. Pass the carpenter’s level across the concrete floor surface to make sure the floor is level. Mark off any high or low spots. Open up the ready-to-use floor patching compound, and stir it well with a paint stirring stick. Fill any low patches on the floor with the compound using a putty knife. Next, feather the edges of the patch so that it blends with the rest of the concrete floor. Leave the patch to dry for about 20 minutes and then sand rough edges with medium-grit sandpaper. Attach the sandpaper to the belt sander and grind off any high spots on the floor. Clean the floor with the vacuum cleaner once you’re done sanding. Cut out a ¼ inch piece of plywood or thicker using a circular saw. The piece of wood should fit the entire floor of the room as you want to have a wooden subfloor consisting of two layers of at least an inch thick. Arrange the plywood over the floor so that the joints don’t align with the subfloor. Allow a quarter-inch gap along the walls as well as in between the joints – this is for expansion purposes. Secure the plywood to the subfloor using 6 inch intervals and 1 inch deck screws along the edges. Make sure you set the screw heads just below the surface. Apply the floor patching compound to the joints as well as over the screw heads and smooth in place. Leave the compound to dry and then sand the rough edges. Clean the floor with the vacuum cleaner to remove dust and debris. Thoroughly clean the old vinyl flooring with normal household cleaner to prepare it for vinyl flooring in Melbourne by Market Timbers. You could also mix a few drops of washing up liquid with water. Rinse the floor well and leave it to dry thoroughly. Apply the floor patching compound, particularly to any old cracks that appear in the old vinyl to create a smoother surface. Leave the compound to dry and then sand away any rough edges with the medium-grit sandpaper. Vacuum any leftover dust and debris from the floor. Preparing floors for vinyl flooring is as easy as that. But be sure to wear a face mask or even a respirator when you sand wood or concrete subfloors and keep all the windows open for good ventilation when sanding and working with the patching compound. So get your floors ready today for vinyl flooring in Melbourne or in your homes.